Greek Default Watch: Are Greeks Lazy? For a country whose pride is wounded by the economic crisis, there is immense satisfaction in one piece of data: that the average Greek person worked 2,109 hours in 2010 versus a German who worked only 1,419 (data from OECD, here). Doesn’t this prove that the stereotype of the lazy Greek is just that: a stereotype? Sadly, it does not. As always, reality is more complicated. 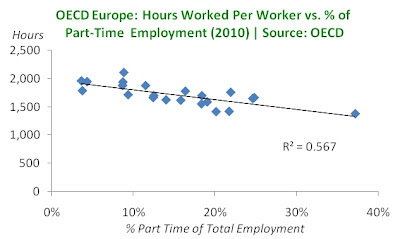 The data shows hours worked per worker – and the numbers show that a Greek employee worked 20% more hours than the OECD average. But what exactly does this mean? The key word here is “per worker.” Think of the following example. Family A has four members of which two are adults. The man works for 40 hours a week while the woman stays home. In that family, the average hours per worker is 40. Family B also has four members of which two are adults. The man works 40 hours a week, as above, but the woman has a part time job for 30 hours a week. Now the average hours worked per worker is 35. So which family works more hours? Clearly Family B works longest but the data gives that family a lower value (35 vs. 40). Could it be that this is what the OECD data is showing? To test this assumption, I tried to match hours worked per employee versus the prevalence of part-time employment (see here). I only looked at countries that had data for 2010 and I excluded non-European countries to control for cultural variety (this excludes, for example, Japan, Korea and the United States). The results, shown below, support the hypothesis: more hours worked tends to be correlated with less part time employment. If you have few part time workers, you work more hours on average. That is all the data is saying. Of course, this only tells us how long people work – it does not tell us how hard they work, nor if they are productive. Just visit any government agency in Athens and you see people who are nominally “working” but are just chatting on Facebook or are painting their nails. Nor should we discount that longer hours are often the result of an incentive system that rewards overtime pay. The evidence supports this by the way: when it comes to productivity, Greece ranks 24th in the OECD (out of 34) for GDP per hour worked, bracketed by Portugal and Slovakia. In other words, Greeks create less GDP for each hour they work than every other EU-15 country besides Portugal. That’s a poor return on investment. Does this mean that Greeks are lazy? Of course not. 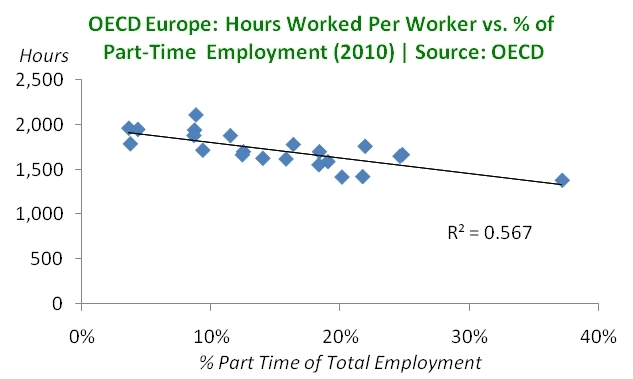 What the data shows is that Greece has a rigid labor market with fewer people who work part time. It also shows that even though Greeks work 20% more hours per employee than the OECD average, they produce 25% less for each hour they work. This is a productivity challenge that Greece will have to solve. More generally, however, the question of whether Greeks are lazy is the wrong one. As in every society there are people who work hard and there are people who are lazy. 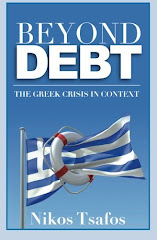 What distinguishes Greece is the skewed relationship between work and reward. There are people who do little work and get paid nothing; and there are people who work immensely hard and are paid well (they may not pay taxes, but that’s another story). So far, so good. The problem is that there is also a large share of the private sector that works very hard for terrible pay. And there are also many people who are paid lots of money to sit on their assess and do nothing – while getting to retire early and enjoy other perks. So there are indeed Greeks who are lazy. The problem is that they are richly rewarded by the hard workers. And that makes no sense. These are good points to remember. However, there are several other things to be considered in whether Greeks are "lazy" or not. First is that most firms are small in size, thus cannot reap the productivity that comes with economies of scale. Small firms also tend to be family owned, and can compel family members (and workers who essentially become members of the extended family) to put in longer hours than a large firm would tend to do. For example, one of my cousins who oversees repairs on vessels regularly puts in 12 and 14 hour days at a family held firm (not his family) that owns a fleet of ships. I can only hope the compensation justifies the labor. Lastly, many people are self-employed and must work longer hours to make ends meet (consider small shops, taxi drivers, restaurants, tourist oriented hotels, and even locksmiths). So the structure of the economy, which reflects perverse legal and economic incentives established by government policies, has something to do with this problem. Good points. Great that finally someone with reason and knowledge does look into the matter and goes beyond the usual talking points! Good job, Nikos. Still, imho there's one important aspect missing: I've read it countless times that in Greece the number of people doing TWO jobs is quite high, in comparison with other EU nations. It's also often said that many administration officials work in a family business after office hours. Since Greece is leading in Europe in the share of small businesses in the economy, this seems to be realistic. But it also leads to the pervert situation that the same guys who mostly "sit on their asses" in office show a lot of energy when they work for their own business. While much of that "self employed" work probably happens in the shadow economy and doesn't show up on official data, I guess at least some of those second job hours drive the statistical numbers up. This is yet another Greek problem that will have to be addressed. In many other nations, officials are expected to put their whole energy into their administrative work, and second jobs are tightly limited by law. That's only reasonable, since the taxpayer can expect to get a fair value for the public sector salaries he pays. I suspect the second jobs and family businesses are a major reason why the administration is so horribly inefficient in Greece. When officals rest at their desks from their hard work the evening before, of course you have to expect meager performance from them. This has to change, but regarding the strong leverage the public sector unions have on politics, it's hard to see how to reform this failed system. Hey Nicos, great analysis as always! "The ability to move forward on big projects and commit capital," is the key ingredient, says Nicos Tsafos, senior manager at PFC Energy in Washington D.C. "That has been impaired." Since you are an Energy expert, I have a question: Projects such as Helios sound very promising, but isn't it a bit naive to believe the electricity could be exported easily? Isn't the infrastructure that enables efficient energy transports missing? For example, in Germany green energy sources are built very fast, but at the same time the government and companies in charge forget to build required infrastructure to save and transport the energy. It is said that there is even a danger that existing energy nets might be overburdened because of the peaks and might collapse. Are there any modern energy nets to transport Greek solar energy to the rest of Europe? In order for a capitalist system to work a worker must get more reward for more effort. The reward does not have to be monetary but there must be reward. It is the bedrock principle of capitalism. In the UK and the US effort during your education is rewarded with higher paying jobs for some and labors of love for others. This simply does not happen in Greece. You could have a PhD in astrophysics and only find work at a filling station. You work more hours to get a job done, No bonus, No time off in lieu, and mostly no Overtime. People who are better qualified do not get better jobs and people that work harder to not get greater rewards. That produces a systemic - perhaps not laziness - but indifference. Thank you for all your comments - excellent additions as always. @anonymous. Re energy, I tend to avoid writing about energy just to keep work and blog separate. But to answer a factual question, Greece produced around 57 TWh of electricity in 2010; it imported another 8.5 (chiefly from Turkey, Bulgaria and FYROM) and it exported 2.5 TWh (chiefly to Albania and Italy). So not only is Greece a net importer of electrity but exports are still a marginal share of overall production. At best it would take a 2x to 3x increase in exports just to net out the imports. And that would require additional investment. "So there are indeed Greeks who are lazy. The problem is that they are richly rewarded by the hard workers. And that makes no sense." Read about the regular local council pay rises in the UK, or the recent windfall boost to Australian parliamentarian's pay (at a time when opinion polls have been low for more than a year) and senior civil service pay. These guys are getting pay increases of perhaps 5 times the official inflation rate, and no one can figure out what they are actually producing. i complain because i work from 09:00 till 20:00 and my salary is 600 the month. if i worked 8 hours a day and the prices in Greece was like Estonia i didn't mined at all to take your salary. Also you must know that the tax system here is way above everything else in Europe. So i complaining because i also have to heat my house i also need to buy warm clothes and food and everything is way to expensive. And the most people here are without jobs but i don't feel like i m in good position for working, most like feel like a slave. To add some more... I produce my one food i collect my own wood from olive trees for heating my house and child so put at least 2 more hours a day to my working calendar. So i think it is not that ridiculous to me. Important article for an important issue. Does anyone know how exactly these numbers are arrived at? If, for example, hours worked at the public sector, are inferred from hours payed, then I suspect that the result is deeply skewed. Anyone with the information on how the hours are measured? The first sentence contains a link to the original OECD data - that includes a description of where this data comes from and how it's compiled.